I like how you can hear each passage all at once (Read Aloud Mode), or tap individual words to hear them. The pages are lively with bright animations, quality music and sound effects (settings to turn these off would be appreciated for sensitive ears though). There are also questions (phonemic awareness and comprehension) on each page of the story. When you touch the little farmer boy in the bottom right hand corner the narrator asks the child a question i.e. Can you touch a word that rhymes with cold? ; Can you touch the ingredient that starts with the /f/ sound? ; Where did she put the gingerbread man to bake? The child touches the correct word or words to register the answer. I like how the farmer boy responds to the child’s choice, along with a narrator praising or encouraging the child to try again. There is also a jump to page feature- I love this as it allows me to revisit a particular page with students for discussion. When using jump page mode you will find the traditional ending with the fox getting his reward, as well as a funny variation. The voice recognition is not there yet, at all- it does state it is in beta and that is accurate. The report card for the word recognition seems to list the same words no matter what; you must read very slowly, and sometimes words or phrases are skipped. There is a link to Facebook- would like to see that hidden under a settings button. The final verdict: I would recommend this (Read it to Me and Read it Myself) as a fun and educational story for children, but if you are purchasing it for the voice recognition, it is just not there yet. IF YOU CAN CATCH HIM, YOU CAN EAT HIM! 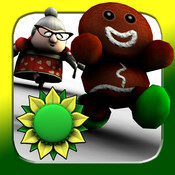 The Gingerbread Man is on the run again in this fully interactive and animated reading experience packed with goodies. Introducing Read Aloud mode, the first and only interactive reading book that uses voice recognition to understand what your child is reading and assesses their performance. Billy the farmer, our learning companion, loves to listen to you read stories and will ask you questions along the way. At the end of the book, Billy will give you a score to show how well you read and understood the story. He will also tell your parents what a good reader you are and if there are any sounds or words you had trouble with, so that you can improve your reading ability. The parent report details the child’s phoneme and word difficulties along with their overall reading level. • Choose your own ending and remember, if you can catch him, you can eat him! This is the perfect app for helping your child learn to read. GroDigital’s app has a voice recognition system to understand what your child is reading. It produces a report card, detailing phoneme and word difficulty. As a teacher, parents were consistently asking me where their children were having difficulty and how they can teach and reinforce reading at home. This app is the perfect tool to answer these questions for parents.